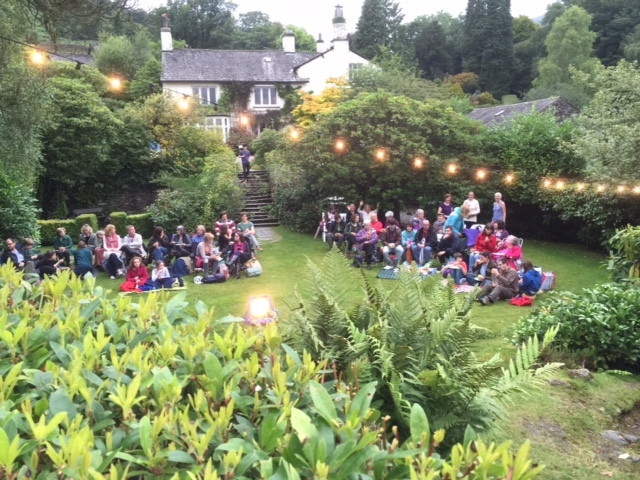 An open-air production of The Tempest was threatened by bad weather in the gardens at Rydal Mount near Ambleside. But the show must go on – so the curator of Wordsworth’s former home invited the players indoors. 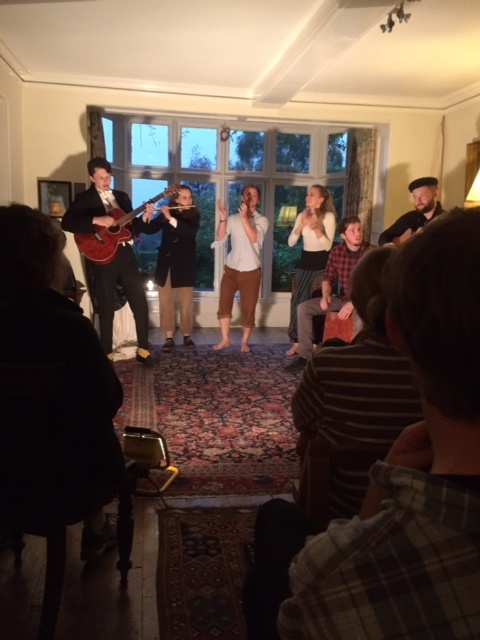 And the Three Inch Fools company performed the rest of the Shakespeare play in William Wordsworth’s drawing room. The touring company had set up camp next door at the Rydal Hall campsite, staying in their own tepee, and using home-made costumes and props. “We are a troupe of travelling actors in the true Shakespeare tradition,” said James Hyde, who founded the company with his brother Stephen earlier this year. This was their first tour, taking in locations in Northumberland and Scotland as well as the Lake District. This entry was posted in Uncategorized on August 21, 2015 by Stagey Lady. Have you seen the latest magazine spread about Wordsworth’s home at Rydal Mount? Well, it’s most unlikely that you have seen it, but millions of Chinese readers have. 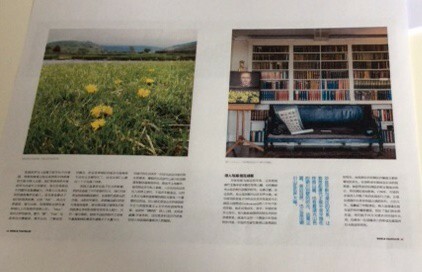 The feature article and many photographs appear in the current edition of the Chinese edition of World Traveller, the world’s most influential travel magazine. The editor and a camera crew visited Rydal Mount near Ambleside earlier this year when they came to make a TV documentary as well as a magazine feature. The team from World Traveller TV and Magazine, who are described by VisitBritain as the ‘Rolls Royce’ of media in China, were also making a travel and tourism documentary. They were accompanied by VisitBritain host Eva Shen who said that Wordsworth was regarded as a “literary giant” in China. 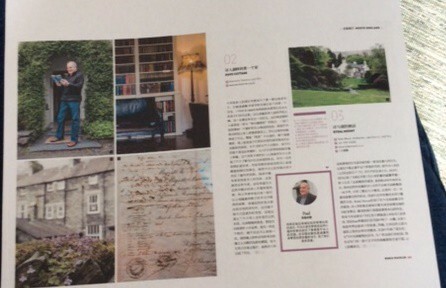 Her colleague, World Traveller magazine editor Jiang Yi, said that Wordsworth’s poetry was studied by all students of literature in Chinese universities. The visitors were given a tour of the house and grounds by curator Peter Elkington, and they were each presented with a welcome pack hand-written in Chinese by a Chinese member of the Rydal Mount staff. Peter has now seen a copy of the magazine. “We are thrilled with the coverage,” he said. 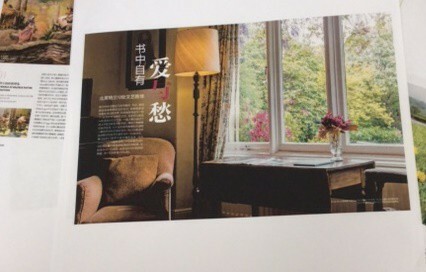 “We have a Chinese member of staff who has translated the article for us, and we are really pleased to see so many photos of the house and gardens. The accompanying film is soon to be shown on TV throughout China. This entry was posted in Uncategorized on August 20, 2015 by Stagey Lady. Local businesses throughout the North West have stepped forward to help a charity event which promises to be the biggest fundraising gala of the year. Project 100-to-1 will feature a grand auction of promises as the highlight of the day at The Villa at Levens, the north’s newest celebration venue, on Sunday (September 6). Three charities will benefit from the funds raised: Macmillan Cancer, Bay Search and Rescue, and the Alder Hey Children’s Hospital. The event is being organised by Kendal photographer Glynis Bland who has taken portraits of people born over one hundred years, from 1915 to 2014. Among them is baby Stanley Taylor who had a successful open heart operation at Alder Hey, and whose story prompted Glynis to start the project. The exhibition will be staged for this one day only. Businesses are offering almost 50 items and promises for the auction, including dinners at some of the region’s top restaurants, a food-smoking course, open-water guided swims, car valeting, afternoon teas, luxury products – and a laptop computer. A massive collage of all the portraits will be revealed on the day and will then be included in the auction. It features a “rogue” image which guests at the event will be asked to spot. The event will also feature music, food and stalls run by a select group of businesses. It also provides visitors with an early opportunity to experience the hospitality offered at The Villa, which is aiming to be one of the north’s top venues for weddings, parties and celebrations. “We are very pleased to be hosting this important charity fundraiser,” said manager Stewart McIntosh. The Villa is a restoration of a 140 year old Victorian house which will feature 22 hotel bedrooms furnished to five star standards, a hall for ceremonies and smaller functions, and a spectacular wedding pavilion. Glynis set up the project after taking photographs of baby Stanley before and after his operation. “His story touched my heart and I wanted to do something practical to help,” she said. Among the portraits is Macmillan Cancer fund-raising manager Sue McDonald, along with several members of her family. 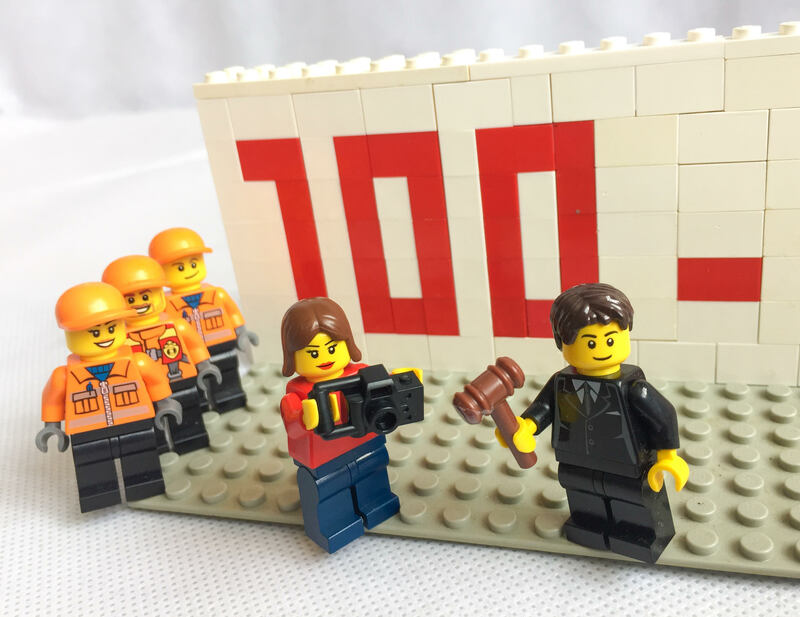 The Bay Search and Rescue Team created a Lego logo to help promote the event, for their online “tiny team” site which has a cult following on social media. Entry to the event, which starts at noon on Sunday, is free. The auction is scheduled to begin at 1.30pm, and the auctioneer will be Kevin Kendal from 1818 Auctioneers. Traditional Sunday lunch will be served in the restaurant, 12-3pm, and soft drinks, teas and coffees will be available. This entry was posted in Uncategorized on August 11, 2015 by Stagey Lady. A book created by two Lake District artists in tribute to William Wordsworth will be launched at Rydal Mount next week (August 18). I Wandered is a celebration of the 200th anniversary of the poem “I wandered lonely as a cloud”, known the world over as Daffodils, and is a permanent record of a remarkable exhibition at Rydal Mount which closes at the end of the month. Both the book and exhibition feature the work of the Japanese artist Hideyuki Sobue and the award-winning poet Gary Boswell who were introduced to one another – and to the intricacies of Wordsworth’s poetry – ten years ago by Peter Elkington, the curator at Rydal Mount, near Ambleside, where Wordsworth lived for the greater part of his life. 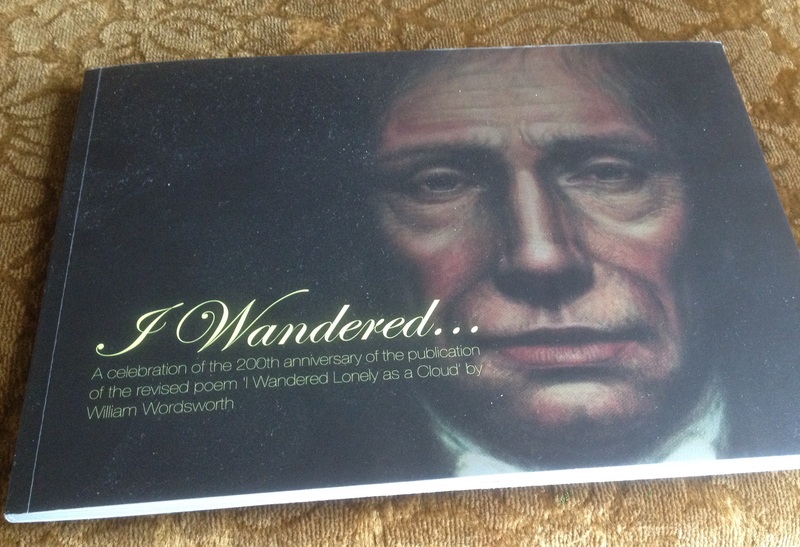 The book cover features the completely new portrait of William Wordsworth which has been the highlight of the exhibition Rydal Mount since it opened this spring. Sobue based the new portrait on the life mask of Wordsworth, created coincidentally in 1815, the year that Daffodils in its final version was published. It forms a diptych – two separate paintings – with a stark picture of a sea of daffodils stretching back to infinity. Sobue used the mask in the archives of the National Portrait Gallery in London as the basis for the new painting, which shows the poet as he would have looked 200 years ago, at the age of 45. Based in the Lake District, after graduating from Osaka University of Arts in Japan, Sobue was elected as a member of the Lake Artists Society in 2008. His work has been shown at a number of major exhibitions in London and throughout the UK. He is a great admirer of Wordsworth and developed his distinctive style in completing what is believed to be the first new portrait of the poet for 150 years. At the opening of the exhibition, Gary Boswell read some of his own work in tribute to Wordsworth, and now the poems and paintings are captured together in a publication which looks set to become a collectors’ item. I Wandered is on sale at Rydal Mount (£10). The exhibition continues until the end of August. This entry was posted in Uncategorized on August 10, 2015 by Stagey Lady. An exciting new design hub bringing together smart technology with the best interior furnishing is to be launched in Cumbria. The new centre at Special Spaces in Windermere will be a showcase for top craftsmen and designers, with state of the art home cinema, audio and lighting set into custom built furniture in an ideal-home setting. The project marks the start of a partnership between two dynamic young companies, smart technology specialists Epixx, and craft furniture creators Lakeland Fells Furniture. They will be joined by award-winning interior designer Alison Tordoff whose Fidget Design furnishings and décor will set off the installations, and glass artist Jo Vincent who is creating a stunning glass kitchen splashback. A showroom dedicated to kitchen design and individually-made fitted furniture is being extended to create a labyrinth of smart-technology rooms. On one wall, an eight-feet wide home cinema is being installed in a lounge filled with craftsman-built furniture. There’s a built-in cocktail cabinet and a hidden door in a bookcase that takes visitors through to a mini conference centre. A fold-down bed set into a wall will demonstrate how space can be used, while the sofas will be filled with cushions from Alison’s Love District range – a tribute to the local Lake District landscape. Alison has designed the interior spaces, and John Barraclough at a Sedbergh company, Wools of Cumbria, has provided carpeting made from the fleece of Herdwick and Swaledale sheep. The partnership was sealed between Andrew Smith, who has been running the Special Spaces showroom and is also hands-on managing director of Lakeland Fells Furniture, and Matt Holmes and Ben Tomlinson of Epixx. Matt and Ben, who say they “live and breathe technology”, needed a location and the furniture to set off their smart home and commercial creations. Andrew’s Special Spaces showroom and hand-crafted furniture – which includes design and manufacturing projects for Windermere Marina Village, the Tower Wood Outdoor Education Centre, and the award-winning Cedar Manor Hotel and Restaurant – proved to be the ideal solution. Together with Alison and Jo, they embody the mantra of the late Steve Jobs, the pioneer of the personal computer revolution, that “design is not just what it looks and feels like; design is how it works”. Andrew Smith, whose Lakeland Fells Furniture innovation in design and expertise in production has been providing furniture solutions to domestic and commercial clients for 10 years, set up his business in 2004 to harness the skills of locally trained craftsmen following recognition of increasing demand within the hospitality, commercial and high end domestic sector for the design and creation of bespoke, hand-made quality furniture. Research by Cumbria Tourism had highlighted the need for the hospitality sector to materially upgrade the quality of accommodation provision available in the Lake District to ensure that customer expectation of a world class visitor destination was not compromised. The demand created for bespoke furniture also highlighted an associated requirement for specialist joinery skills for finishing off installation projects such as bespoke skirting boards, dado and picture rails, architectural mouldings, panelling, hardwood doors and windows. Four years ago, an extra dimension, Special Spaces, was established to supply and install fitted furniture including fitted kitchens, bedrooms, commercial offices and home studies. Epixx, which will be based at the Special Spaces showroom, are independent consultants and designers specialising in home cinema, HDTV, lighting, music, and smart security. Due to open at the end of September, the design hub will be a showcase for anyone needing home or commercial technology, with items for sale, and where bespoke designs can be ordered. This entry was posted in Uncategorized on August 6, 2015 by Stagey Lady. Local businesses throughout the South Lakes are stepping forward to help a charity event which promises to be the biggest fundraising gala of the year. Project 100-to-1 will feature a grand auction of promises as the highlight of the day at The Villa at Levens, the north’s newest celebration venue, next month. But more donations are needed to help the three charities that will benefit from the funds raised: Macmillan Cancer, Bay Search and Rescue, and the Alder Hey Children’s Hospital. The event is being organised by Kendal photographer Glynis Bland who has taken portraits of people born over one hundred years, from 1915 to 2014. Among them is baby Stanley Taylor who had a successful open heart operation at Alder Hey, and whose story prompted Glynis to start the project. Businesses are offering items and promises for the auction, including dinners at some of the region’s top restaurants, a food-smoking course, open-water guided swims – and a hand-knitted Arran sweater. A massive collage of all the portraits will be revealed on the day and will then be included in the auction. It features a “rogue” image which guests at the event will be asked to spot. The event will also feature entertainment, food and stalls run by a select group of businesses. It provides visitors with an early opportunity to experience the hospitality offered at The Villa, which is aiming to be one of the north’s top venues for weddings, parties and celebrations. Entry to the event, which starts at noon on Sunday September 6, is free. There will be food available, and visitors can also book lunch at The Villa restaurant. The auction is scheduled to begin at 2pm, and the auctioneer will be Kevin Kendal from 1818 Auctioneers. Anyone with gifts or promises to offer can call Glynis on 07919 201711. This entry was posted in Uncategorized on August 3, 2015 by Stagey Lady.